0:36 | Bangkok Governor, Police General Asawin Kwanmuang, has participated in the planting of 1,158 trees in the Charan Sanitwong area of Bangkok as part of a Pracharat project, aimed at increasing public awareness on the importance of preserving the environment and green areas in the city. 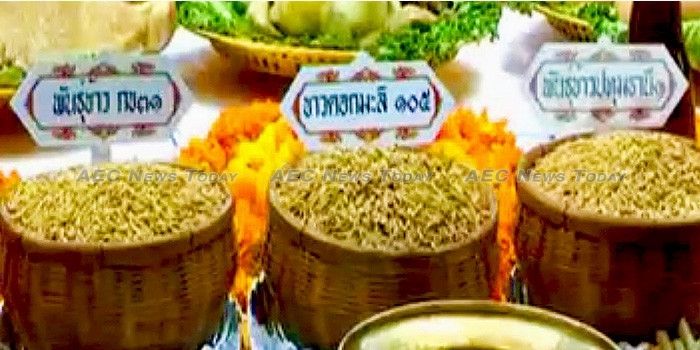 01:55 | The Rice Department has held a Brahman blessing ceremony for rice seeds to be used in five plots in the shape of the number nine in the Thai alphabet at the northern perimeter of the crematorium at the main entrance to the late King Bhumibol Adulyadej’s funeral pyre. Three fragrant strains, Pathum Thani 1, Dok Mali 105, and Kor Khor 31, have been chosen and will be divided into 58,000 planting pots across an area of 0.16 hectares (0.4 acres). 04:13 | Prime Minister General Prayut Chan-o-cha has said that King Maha Vajiralongkorn has instructed the government to urgently provide assistance to flood affected people and to keep them happy by maintaining social order, promoting discipline, and preserving Thai traditions. 05:34 | Prime Minister General Prayut Chan-o-cha said yesterday that Cambodian Prime Minister Hun Sen has expressed his gratitude to the Thai government for tackling problems related to Cambodian migrant workers in Thailand and vowed to support Thailand’s work by issuing passports to Cambodian migrant workers at the Cambodian embassy in Thailand. More than 700,000 employees and migrant workers have registered their employer-employee relationship status with Thai authorities and are currently going through a verification process. The Thailand government has said that the verification process will not be extended. 06:24 | In response to delays lasting up to six hours at Don Mueang International Airport immigration counters, Prime Minister General Prayut Chan-o-cha, has ordered an action plan created to prevent the situation occurring again. 07:56 | The Cabinet has resolved to approve the enterprise development law proposed by the Ministry of Finance (MoF) aimed at raising the efficiency of state enterprises to international practices. The draft law will be examined by the National Legislative Assembly (NLA) and is expected to be passed before the current government’s term ends. 09:08 | United States Secretary of State, Rex Tillerson, met with Prime Minister General Prayut Chan-o-cha on Tuesday to request Thailand cut business ties with North Korea (DPRK), while at the same time asking the Thai government to accommodate DPRK refugees – whose numbers have soared in recent months. Thai foreign minister, Don Pramudwinai, confirmed that Thailand will adopt the fresh United Nations (UN) sanctions against DPRK over its missile tests. 13:54 | Chairman of the Constitutional Drafting Commission (CDC), Meechai Ruchuphan, said that the use of numbers to represent political parties and candidates on ballot papers was necessary to make it convenient for voters, especially those who are illiterate, to cast their votes properly, as well as to assist with accurate vote counting. 15:32 | National Legislative Assembly (NLA) President, ‎Pornpech Wichitcholchai, has refused to comment on rumours which suggest that political parties and their candidates should not carry the same number while running for future elections. He said he has not received any information on the proposal by the Constitution Drafting Commission (CDC). 17:49 | A survey conducted by the Center for Economic and Business Forecasting (CEBF) at the University of the Thai Chamber of Commerce (UTCC) found that despite causing Bt9.5 billion ($285.628 million) in damages the northeastern floods are expected to only cut 0.064 per cent from 2017 Thailand GDP. Some 31.7 per cent of all businesses in the flood-hit provinces were found to be directly affected, while 46 per cent said they were indirectly affected. 19:16 | NBT World takes a look at the commemorative anniversary of Asean at 50 in Manila, Philippines, and its accomplishments since its inception in 1967.